Please scroll to the bottom to watch the creepy videos and see for yourself. At the Wingate Hotel in Illinois, there were loud noises and screams coming from room 209. A Hotel worker goes to investigate and when he steps in, an apparition floats out of the door. The worker tells his manager that furniture is upside down, the carpets are torn and the shower’s running so they call the police in a panic. 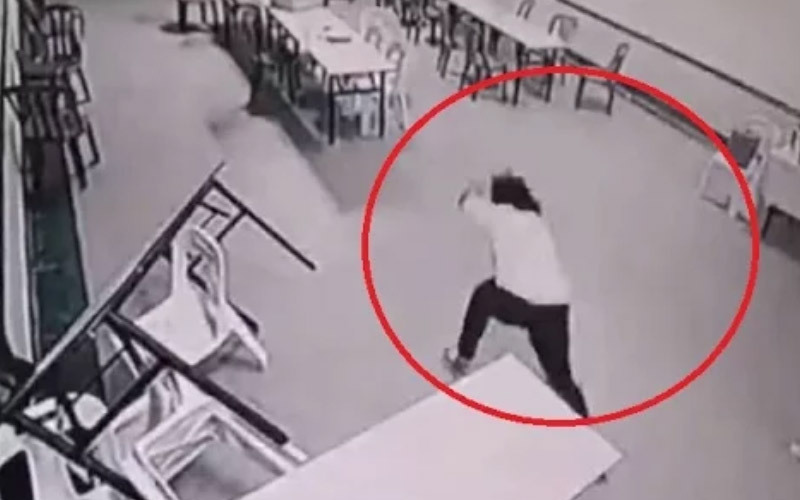 The second video is from a Malaysian Hotel, where we see a chair moving and a door close on its’ own. In another room, there’s a woman sitting at a table. The chairs begin moving about – causing her to panic and run blindly – like ghosts are chasing her. She hits her head on a table and passes out on the floor. In the third video, a Manchester building in England is haunted by a variety of poltergeist activity. We see chairs rolling around like they’ve been pushed roughly, computer screens flickering, door handles being pulled, drawers opening with papers spilling out and a door slamming shut – all from different angles. The fourth video is from the Whitstable Nutrition Center in England, where we see a man browsing one of the shelves while a box of teabags floats out from the shelf behind him. When something falls from the shelf he’s looking at, he bends down to pick it up – then he sees the teabags before they drop on the floor. In the fifth video, we see the Carlisle Castle Hotel in Australia, where an apparition in a vacant room seems to be eerily waving at the security camera. Then a man is seen getting something from a fridge in another room, where bottles fly out onto the floor behind him. At the bar, a glass smashes on the floor – startling a woman nearby.